Is it just me or is everyone having babies right now? Perhaps I'm just at that age. Whatever it is, I love it and it makes me excited for when the day comes that Jon and I have our own little ones. In the mean time, I'll just admire everyone else's new bundles of joy and dream of nurseries. My favorite nurseries are usually ones that don't scream "It's a girl!" or "It's a boy!" Maybe it's because I'm naturally drawn toward a neutral color palette with my design aesthetic. Or maybe it's because soft, calming tones remind me of a sweet, sleeping baby. 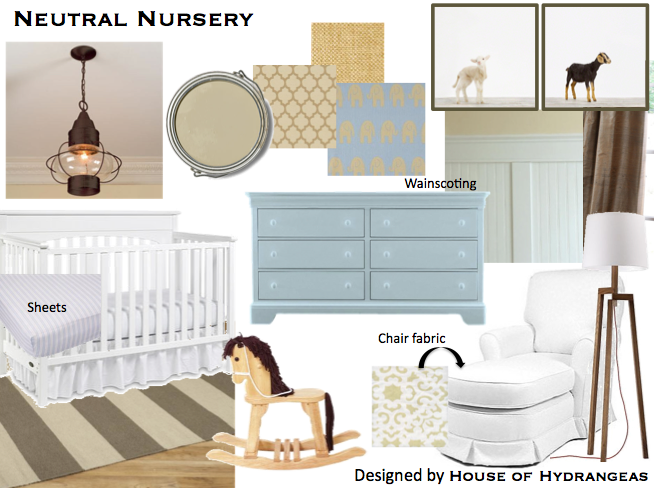 Whatever the case may be, neutral nurseries make my heart happy. To show you what I mean, here is one of my latest designs. Starting off, I suggested painting the room Bleeker Beige by Benjamin Moore (you can get it color matched in Olympic Premium for the non-VOC paint route). I also suggested adding white wainscoting to the bottom portion of the walls. Tying into the white wainscoting I brought in this streamlined white Lauren crib by Graco. Adding balance to the weight of the crib, I'd opt for this sky blue Young America dresser by Stanley All Seasons instead of the traditional changing table. A dresser offers you plenty of storage, while still having space for a changing pad. And best of all, it can stay with your child as they grow up. I'd switch out the traditional wooden knobs on the dresser for bronze knobs to pick up the finish in the lantern light fixture. For mom, I love Little Castle, Inc.'s gliders and chaises covered in their corsica pistachio light fabric. This is another piece that could easily transition to another room in your house later down the road. For artwork, I'd use these sweet and simple baby animal prints by Sharon Montrose at The Animal Print Shop. All of her prints are absolutely adorable! To bring in some layers to the room, I'd suggest this Regatta Dhurri striped rug, some brown faux silk curtain panels and pillows and bedding in contrasting patterns--bocce linen geometric, tan linen and elephant print cotton fabrics. Add a white bed skirt and striped blue sheets to the bed and the room is near complete! All that's needed now are a few minimal accessories like this wooden rocking horse and stilt floor lamp for late night feedings. I couldn't agree more about the nurseries- neutral is best! I love the design board you put together, it has the perfect balance. All my friends are having babies too, every time I turn around someone else is pregnant!